This morning I woke up late with a headache and the scratchings of a cold on the way. Instead of my normal 6am start: time for checking my emails, facebook updates, web statistics, reading, etc. I slowly made a cup of coffee, potted about, got dressed and then realized too late that I hadn't prepped my 8am lesson. My 8am's only 15 minutes walk from home but by the time it occurred to me that beyond their homework I didn't have any materials ready for our lesson, I had 15 minutes to go. CNN student news, of course. If you haven't seen this site and haven't used it in an EFL lesson yet then check it out! The site comes with video (mp4 via i-tunes), transcripts of the text and question sheets. Simply print out what you need, download the vid (free) pack up your computer and go. In class, watch the video a couple of times (once without the transcript, once or twice with), go through the difficult vocabulary, do the questions and discuss the most relevant story in detail. This takes an hour/hour and a bit. If there's something of specific interest to your students within the report (in my case with this week's: the US financial crisis) then their homework is to follow-up on the story in the local press and report back next week. 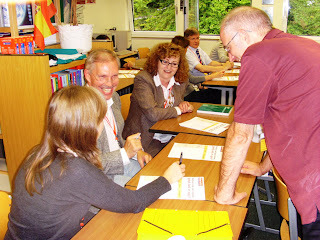 As promised in my previous post, I'm going to give you the skinny on the excellent teacher-training workshops I attended at the ELTAF 2008. I'll be posting here and there, in between classes so they will unfold gradually. "Magic" formula for getting your students reading. The blurb for the workshop read "Classroom time is limited and we need techniques to extract the maximum benefit from students' reading." In the initial moments of this workshop we watched as he fiddled around with the Smartboard and his powerpoint presentation & my heart sunk. He seemed young, not so confident of his materials, kept double-tapping the screen (how fast we all learn, few of us had ever seen a SmartBoard before but after two previous sessions we were all experts "Tap once, Duncan" we said, feeling as frustrated as he must have done that he hadn't done a prior run through of the technical equipment). 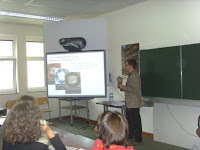 Plus his first slides seemed to indicate this was actually a workshop for teachers of kids or teenies. I teach mainly adults. Man, I love to be proved wrong! Duncan introduced the Bookworms club, a Reading Circles system. After going through the teachers'handbook, he split us up into groups and got us to become his reading circle. 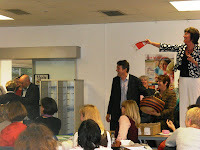 It was brilliant - AND I've tested out the materials in two classes so far, it works (not just in a workshop!;-). My role was to be the culture collector and it was my job to read the story, looking for differences and similarities between my culture and the one in the text. I also had to think of some questions to ask the group. Our story, from Bookworms Bronze, was called Little Hunters at the Lake. This role led me to recognize the religious and/or philosophies within the story, to acknowledge the universal love for animals, no matter the culture, and how in my own culture they'd be really little chance of boys finding a gun in the house to go hunting with! We had a dynamic conversation about the boys' emotionality and whether boys in Germany (or wherever else) would be capable of the same depth of feelings as the two little boys, Ali & Hikmet. The other roles were just as exciting, the word master extracted words and we discussed them and their significance, the connector found relationships to his own experience, and the passage person found areas she thought most central to the story. My feedback, on the down side, would be that you really need to know what you're doing. The discussion leader's role sheet does not clearly provide guidelines to help him/her lead nor notes on the other roles in his group - although it does provide a framework for asking questions of the other participants. My suggestion to the teachers deciding to try out this system, would be read through the teachers' handbook thoroughly before stepping into class and doing it. Because, honestly, once your students understand what's required of them, reading pretty seriously and suddenly becomes speaking. And that's our goal, isn't it! Small groups of students who meet in the classroom to talk about stories. Language learners are encouraged (by having a defined purpose) to have 'real-life' discussions about the stories they've read. In each Reading Circle, each student plays a different role in the discussion. There's also the possibility of extending the roles, adding, for example an illustrator and background investigator. At the back of the book, there's a very exciting further activity called "plotting the pyramid" and it gives students the opportunity to examine the construction of a story, breaking it down into different sections: exposition, complication, rising action, climax and resolution. Supportive role icon badges (perhaps a little "young" -it'd be sweet if OUP could make a series and icons for adults and perhaps a business reader series) and photocopiable role sheets can be downloaded from the OUP website, free of charge. They motivate students to acquire both the habits of reading extensively and of working autonomously. They make talking about texts interesting and provide a framework for having a good discussion in English. The OUP website is truly a minefield - now why is it that British websites so often are? Both the British Council and BBC's are also very complicated. sigh. BUT after a fifteen minute search - yes, I'm determined, I finally found the links you need to get sample pages and downloadable sheets. p.s You may also be interested in my supportive conversation materials for students who love talking about books and reading. One of the best things about a PNS (or a participants-no-show in KMP speak) is not that you get paid for not teaching, but that you get to rush back on home and finally catch up on the long list of things to blog about instead! Teaching conferences are super fun - if you don't believe me, just ask any teacher who's been to one recently. Generally, if you belong to a good teaching association, you'll get a newsletter or yahoo group notification from them about once a year, pleading with you to fork over some cash and go attend a conference. Guys: ignore the cost, write it off of taxes for heaven's sake, plead with your DOS to take you seriously and fund at least half... and go to these things - there's really little else more fulfilling as a language trainer than some great professional development. The other day, a fellow teacher said to me "you mean, you still prepare your classes?" - er, duh. Alright, enough of the lecture-hat. 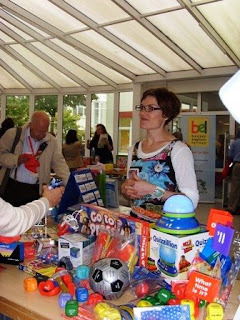 Let me get on with telling you about what happened at the very exciting ELTAF conference held in Frankfurt, Germany. 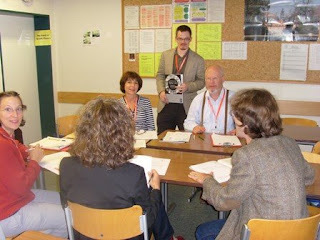 The line-up was extraordinary: trainers from all over Europe, from all the great ELT publishing houses, writers of the methodology books (you know the ones on your shelf that you haven't read yet) and over 40 workshops were on offer. From this list you could only choose 4 - Yikes! Dilemmmmmmmaaa?!?! I must say that back in July, when I did my on-line registration, I fretted and fussed about which ones to go to... I mean what do you do when you've got Comfort, Rosenberg, Newbolt - all scheduled at the same time? 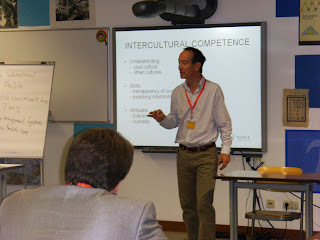 Not to mention that there'd be a workshop on using youtube, testing intercultural competence, English for engineers, speaking skills with the six-hats method, a Sharma workshop...clashes abounded, how could I be in three rooms at the same time? Oh heck, I mean how'dya choose? This is money we're talking about. Who can teach me the most? What is something I know nothing about but really should, ARGH, headache. I clicked and then promptly forgot which I'd chosen, sounds like me. Well, a mix-up and a wrong email address, 2.5 months later (from my side, of course) - I never use my real website account address when signing up for things, it's a spam phobia thing - occurs, and this mix-up almost led me to missing the whole conference! But phew, the ELTAF administrators (Tricia Hunter and Daniel Payne) were super helpful and they sorted out my app in no time at all - and even let me change around one of them ;-) you'll never know which, so don't even ask. Anyhoo, I happily found myself scheduled for the Comfort, Laing, Dudeney and Beder workshops. Unfortunately, Beder ended up being unable to present that day which meant being shoved, last minute, into McMaster's - a workshop I wasn't really looking forward to going to. Reason: deep rooted fear of the 'blah, blah' factor. McMaster is editor of Business Spotlight and the workshop was unfortunately titled "Natives and non-natives: good, bad or ugly?" Yeah, really. Teachers: every now and then, the "blah, blah" is really, really good. I'll be giving you the skinny on that one later. BUT in order not to turn this entry into a war epic, actually I'll blog about each workshop separately. You'll just have to come back - if you want the juicy details. So I'll wrap this one up by saying it was a great conference - in three words: professional, well-organized and dynamic. There could have been more coffee - I missed it three times, seriously! The SMARTboards were for a techie like me - the coolest bananas. Overall, ELTAF and the Frankfurt international school students were efficent and everything went smoothly - we got some free books - er, hallo, Heinle and OUP I'm still waiting for my promised post to arrive! And... there was loads of chatting and networking with super teachers and trainers, I got to meet the Timberlake of ELT, Mr Sharma himself, laughed and touched base with my dear friend Laura who I miss oodles since she took a job with Macmillan as a sales rep and I had lunch and a mini argument with Gavin Dudeney over the values of Twitter vs. Facebook. Ya kno' - fun, fun. So... upon consideration and fed up with not being able to manipulate my web blog so that I can effectively change around style things and do other fine and dandy tricks like add videos and/or cool links and pikkies (without having to pre-save them in the back page - tediously dull and time consuming)... I gave up and have decided to come back to the blog that I'd started round about a year or so ago. 'Fraid there's not too much here at the moment... but more's a coming. As I mentioned in a previous blog entry, one of the questions I get most often asked in my new media and technology workshops is "how do I get a video from youtube on to my computer?" There are several different options which I'll explain below. I'll give you instructions for two different browsers, Firefox and IE - but I don't have an Apple so can't comment on Safari. As far as I've been told, it's the same. The difference between the two browsers is that Firefox is really much quicker and in my opinion, safer and more efficient. The other thing I like about it is that you have many, many cool 'add-on' functions which are designed to make the whole "falling down the Alice-in-Wonderland tunnel of time" experience better. In their ADD-ONS pages they offer several 'functionality changing' options. When you open the Add-ons page in the search box, you can type in the words "video download" to find suitable programmes. There are, at the time of this writing, 619 options!!! Now, you don't want 619 different programs, right? ...is to always read through the blurb and check how many other people are downloading it regularly. When I see that a program has been used over 100,000 times, I reckon they'd be a report about it and some very unhappy reviews if it's no good/ may cause problems to my program files. (And yes, I search for these comments). I know it's time consuming, but I truly recommend reading the comments pages before you download free programs - just in case it's some idiot who is manipulating the numbers. Much harder in general to manipulate feedback/ reviewers which is why I take the time to read them. Anyway, I'm getting sidetracked ;-). Nowadays I use the program called Media Converter. And after trying three or four different programs, this is the one I find easiest and most convenient. There are 4 steps which you have to go through each time but in the end you have a fully usable video for your class. Both of these programs will stick an icon on to your toolbar. A toolbar is that thing at the top of your page where you type in "google" or hit the star to bookmark a site you like, refresh your page or any of the other icons. An icon is a little picture that leads you to a specific function of your computer or internet experience. If you're using video download helper, whenever you're on a site where there is permission to download video, the icon starts moving around, notifying you that you can copy the file if I want. This is a nice feature when you're out and about surfing the 'net and then suddenly you realize that the video you're watching is something you could use in class. It tells you what the format of the video is and if there is an option to select between types of files to download you can choose between these. MediaConverter doesn't move around and does not support all video sites however once you click on the little bird thing, if you can't grab the video then you can't grab it! MediaConverter goes through a slightly longer process when downloading than Video Download Helper however so far I have had much better results with it. Video Download Helper tends to makes a tiny video when you run it on your Windows Media Player and it also adds its company logo (which can block part of your image). Media Converter is a bigger video (easier to watch) and doesn't add a logo. Anyway, it's pretty simple, right. Told ya! Okay, so NOW you're ready to grab videos, stick 'em on to your laptop and walk into class...plug in the beamer (or ask your students to, they know how trust me) and bob's your uncle. But, wait, I still have to tell you the IE way of doing this if you've not got Firefox. If you have firefox, you don't need to read the rest of this entry. Did I mention that firefox is better, ah, yah... the unbelievers, okay I'll still give you instructions for IE too ;-) I'm gonna go eat something first, before continuing this entry. You can also get copies of the videos you find on youtube or other video sites like: howstuffworks, blip.tv, teachertube , google-video etc. if you are using IE. It's not difficult, either, just a few more steps is all. First of all, choose the video you're interested in, from one of the sites I mentioned above. Then you open up another window so that you can work in more than one location (look at the top of your page below the toolbar(s), there's something there that looks kind of like an office archiving system -in pale blue grey, click on the second of these - which'll open up another window or tab). In this window, go to leechvideo. And leave the page open. Go back to the video you liked in the other 'window' and look at the top of your screen in the white box where the internet address of the file is located. Click on this to highlight this address. Press the CTRL (or Strg in German) button and the letter 'C' at the same time. This will copy the address link. Tab (move windows or click over) to the leech video website. Click in the white box. Press the CTRL button and the letter 'V' at the same time. This will paste the internet address of the file you want into the white box. p.s. If anyone's got any other instructions (perhaps for Mac computers) - or alternatives to the above, please add them below in the comments box. p.p.s Don't want to lug your laptop around, get a netbook instead. See this review of various. p.p.p.s I have a youtube channel where I collect videos, but so far I've been saving them under "education" - once I've sort through these I'll do another series of blogs on how to use videos in the classroom. These are mainly youtube videos - there's a whole host of other great sites, tho'. Feel free to look around in the playlists though -there's bound to be something useful for your BE classes! In the meantime, one of my favourite online teaching colleagues, Carl Dowse, has been saving a bunch of video he uses for business classes - he's got a great selection. You can find them here. I reckon the problem is one of focus or purpose: I mean what should I actually write about? Ha, isn't that a funny quandary for a writer. Developing a website by myself - learning all the tips and tricks, nah. Boring, done. This blog was first done on my website 9 Sept 08.